The Australian and New Zealand Division, commanded by Major-General Sir Alexander Godley KCMG, formed part of the Australian Imperial Force (AIF) during the First World War. It was the second complete AIF infantry division to be raised, and together with the 1st Australian Division, took part in the Gallipoli landings at Anzac Cove on 25th April 1915. This article will look at the Order of Battle for the Australian and New Zealand Division. Photo to right of Sergeant George Tinsley Thompson who was killed in action at Gallipoli on 7th August 1915 aged 24. The 1st, 2nd and 3rd Australian Brigades, all raised in August 1914, formed the infantry element of the 1st Australian Division. Like these first three brigades, the 4th Brigade was also Australian in composition and was raised in September 1914. The men in this brigade were formed into the following battalions. Raised in New South Wales and trained at the Malabar Headland, south of Sydney. Raised in Melbourne and trained in the Broadmeadows area of the city. Most of the men in this battalion came from Melbourne and its suburbs. Three quarters of the men who volunteered were from Western Australia, the remainder from South Australia. "It was decided to send two battalions from each island--one from each of the principal provincial districts; and the geographical situation of the Territorial Regimental areas made it possible to allot four Regiments to each battalion, for the purposes of recruiting." Comprised of men from the 3rd (Auckland), 6th (Hauraki), 15th (North Auckland), and 16th (Waikato) Regiments. Comprised of men from the 1st (Canterbury), 2nd (South Canterbury), 12th (Nelson), and 13th (North Canterbury and Westland) Regiments. Comprised of men from the 7th (Wellington West Coast), 9th (Hawke's Bay), 11th (Taranaki), and 17th (Ruahine) Regiments. Comprised of men from the 4th (Otago), 8th (Southland), 10th (North Otago), and 14th (South Otago) Regiments. In turn, the companies of the four New Zealand battalions were given the same numbers as the regiments. Thus the four companies of the Auckland Battalion were designated the 3rd, 6th, 15th and 16th; the four companies of the Canterbury Battalion, the 1st, 2nd, 12th and 13th and so on. Throughout the war, endeavours were made to maintain the identities of the New Zealand battalions by supplying local drafts of men to the relevant battalions. Three batteries each comprised of six eighteen-pounder guns. Departed New Zealand on 16th October 1914. The first battery ashore was the 2nd Battery which landed at 3am on the 27th April. First two guns landed at 6am on the 26th April and came into action. The remaining guns landed later. Landed on the afternoon of the 25th April. The 7th Indian Mountain Artillery Brigade comprised the 21st (Kohat) Battery, the 26th (Jacob's) Battery, the Second Indian Field Ambulance, and the Second Ammunition Column and Supply Detachment; around 800 men altogether. The 26th Battery landed on the 26th April and immediately went into action. It would be the last artillery unit to leave Gallipoli. A force of eight officers and 229 other ranks commanded by Major J Hall Brown whose role was to perform operational duties for ANZAC headquarter staff. 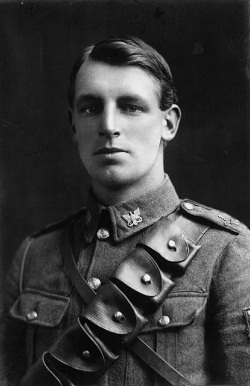 The photo accompanying this article comes from the Imperial War Museum's Bond of Sacrifice collection and shows 13/144 Sergeant George Tinsley Thompson who served with the 3rd (Auckland) Mounted Rifles, New Zealand Mounted Rifle Brigade, Australian and New Zealand Army Corps Mounted Division. Sergeant Thompson was killed in action at Gallipoli on 7th August 1915 aged 24. © IWM (HU 96734). Visit the Imperial War Museum Faces of the First World War project. Paul Nixon's paternal grandfather, maternal great-grandfather and countless great uncles and second cousins served their King and Country during the First World War. Paul's interest began in the early 1980s when he interviewed and corresponded with scores of surviving Great War veterans in southern England and the Midlands and subsequently published research on the community of Chailey in Sussex between 1914 and 1918. In recent years, Paul has studied recruitment patterns in the British Army in depth and is considered an expert in regimental numbers between 1881 and 1918. When he does not have his head buried in a military database Paul is the attentive father to three small children, and the loving husband of a long-suffering wife.